After trying the two different electrical pulse rates the previous day, my brain had become more accustomed to processing sounds that were coming in at different speeds. The faster speed actually did make some things clearer. It didn’t mean that I was hearing things faster; some things just required less effort to understand. In the car ride to the hospital, I could understand a few words on the radio, and I could understand when the GPS said “turn right” and “turn left” although I had no clue what she said in between those. Today, we were going keep testing with different speeds to see if there was one that could make things even clearer? The only way to determine the right cochlear implant pulse rate for you is to try it. While there seem to be some trends in relation to speed and type of hearing loss, everyone truly is unique. According to my audiologist, many of her clients did better with a medium stimulation rate, but older people seem to hear better with a slower rate. But that’s not set in stone, as she has seen seniors that performed better at a high rate. Another CI user told me that people who were born deaf or who have had a hearing loss for a long time seem to perform better with slower rates, and those who have only had their hearing loss for a short time seem to hear better with faster rates. A 2009 study published by the International Journal Of Audiology showed that many CI users understand speech better in noise when the rate is set 500 or 900 pulses per second (pps). You can read this study here by downloading the full text. CI rates can be set at many different speeds. Some popular ones are 275, 350, 500, 720, 900, and 950 pps. So we increased my CI threshold a bit again, and then, we added two more programs with different speeds. Joanie cloned the first program twice and had me test the volume by doing the test in which she plays two sounds and I tell her whether they are at the same volume. After going through that, I now had four programs on my CI. One at a low speed (either 300 or 500pps), two moderate (720 and 900) and one high (1200). She made me a schedule that I stick to over the weekend so that I could try all the programs and see which one I hear better with. Joanie programmed my CI and set up the advanced CI remote control so I could us e that to switch programs. The remote control can hold four programs and helps you switch from program to program. 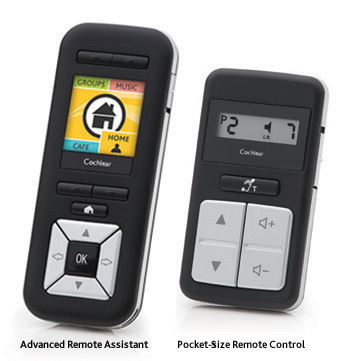 With the mini remote, or with the buttons on the earpiece, you can only switch programs by pressing the up/down buttons. So you can’t jump from one to three. We then did the same sound detection test in the audiology booth as we did the day before, but this time, we tested all four programs. Only, they were all mixed up. So I had no clue which programs were being tested. this was because she didn’t want to give me an idea of which one I could currently best with, because she wanted me to really work to try to identify the over the weekend. Once we determine the best speed, she’ll be able to create actual programs using the appropriate stimulation rate. She then went over the CI Safety document with me. There are so many things you have to be careful of doing with a CI, and even some things that you can’t do. I’ll write a separate post about that in the future. Over the weekend, I tried to listen to as many things in different environments as possible. I listened to the radio, played thing on You Tube, and tried to watch TV. A lot of it sounded robotic, and when I watched TV it sounded that there were metal cans over the speakers. Next: Back to Quebec for week 2, exam week.